Former Pakistani Captain Imran Khan under whose Captaincy Pakistan won Cricket World Cup of 1992 has said that if Pakistani team plays with Unity as one unit then there are high chances that Pakistan will win the World Cup. 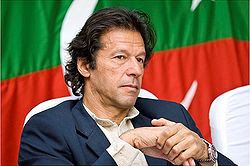 Imran Khan said Pakistan will have to play with Strategy. He said top 4 Batsmen must be Specialist. Imran said Abdul Razzaq, Umar Akmal and Kamran Akmal has massive talent but they have failed to show it on ground. Former Captain also advised Shahid Afridi to play role of a good Captain during World Cup. While talking about recent Scandals in Pakistani Cricket Imran said these Scandals has harmed Pakistani Cricket very much but now its time to move forward.